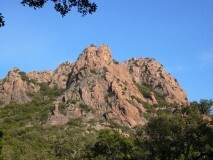 The “Rocher Rouge” (red rock) north-west of Roquebrune-sur Argens offers far reaching views on the outback in case of good weather. The trail lies on the southern side, the northern side is only walkable with climbing equipment. Even on the hiking trail there are spots which require good shoes and having a head for heights! 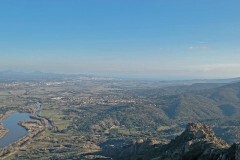 The route to get to the hike goes through Roquebrune. At the end of the town – before the bridge crossing the Argens – turn left (see map below) and follow the small road for several kilometres. Once the mountain range is visible as on the picture bellow and a few houses lie in front of you, park your car. The trail starts between the first and second house. The shorter (marked) path branches off to the right, the long one to the left (big parts of it are difficult to walk upon).